This plugin adds a search bar to the emoticons list to help make finding a specific emoticon easier. 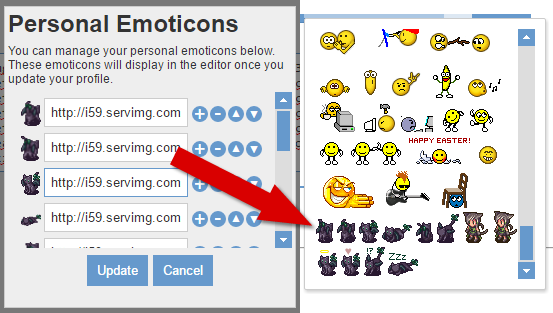 It's an ideal plugin to have if your forum has a large list of emoticons ! Note : When looking for emoticons, the plugin searches the emoticon code and title, so make sure to use descriptive words for your emoticons to make finding them easier ! In this quick tutorial you'll find out how you can add a copy code button to your Forumotion forum, similar to the one that's on Forumactif Edge. Clicking this button will automatically copy the code contents to your clipboard without having to right click or CTRL+C ! Note : This may not work for some outdated browsers. See Browser Support for more information. This plugin enables search bars to automatically search for topics as you type. Searches are performed with the wildcard(*) to ensure that you get results without having to type the entire word. The plugin is optimized to work on any search form in the forum. Simply install the plugin and all search fields will bring up results as you type ! This plugin displays a preview of groups when you hover over them on the legend, allowing you to quickly view a brief summary of the group. Note : For this plugin to work you must have the following option enabled. This plugin gives your members the ability to create their own personal list of emoticons which they can use in the editor. It's a great addition if you want to give your members the freedom to use the emoticons that they prefer ! These custom emoticons are unique to each member, and display at the top of the emoticon list by default.